What’s Up in the STEM Room? And a $10 Tuesday! The Library where I work has a small multi-purpose room. We call it the STEM room. Most days we have a live feed playing on the monitor via AppleTv and an iPad. For most of the Spring, we had the Hanover, PA eagle cam playing… until the eaglets spread their wings and moved the camera. Lately we have the Tennessee Aquarium playing in the background. It’s relaxing to see the animals in the water and gives patrons of all ages something to talk about. In the STEM Room we offer hands-on fun like Keva Planks and Magnaforms as well as other products from Lakeshore Learning. Last year the local high school science teacher contacted us and asked if we could somehow collaborate with them and present science to kids. We were thrilled. I’m a generalist, not a specialist; and as we’ve discussed before, science isn’t my thing. He recruited students to volunteer and the STEM Squad was born. Kids teaching kids. It’s a really great thing! Today we had our first program. The theme was solvency and the activity was shaving cream tie-dyed cards. 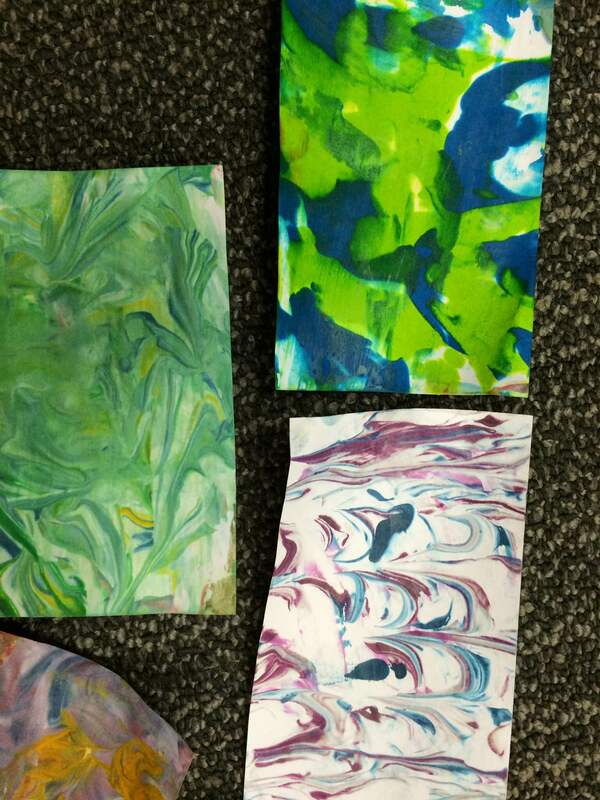 Less tie-dye and more marbling…but fun nonetheless. Like every drop-in program, we had no idea how many kids would actually show up. The leftover index card count was 7, which meant 93 cards were made. Place a small amount of shaving cream in the foil pans. Add drops of food coloring. With the popsicle sticks, marble the food coloring in to the shaving cream. It’s best to leave some white — too much mixing will create colored shaving cream and not give you the pretty marbling you’re looking for. Place the index card onto your shaving cream. Give it a good press and remove. Scrap the remaining shaving cream off with the popsicle stick and blot it dry. I think they’re really pretty. 1. Putting four different pieces of candy (don’t mix the candies, pick one brand per dish) add a small amount of water — enough to cover the candies. You can see it best in this picture.The color is removed from the Skittle and separates into the water. I think it’s fascinating that the colors don’t bleed together. (At least until dish is upset, then all bets are off.) In the second dish, the colors are completely gone and the whitish part is the sugar dissolving. 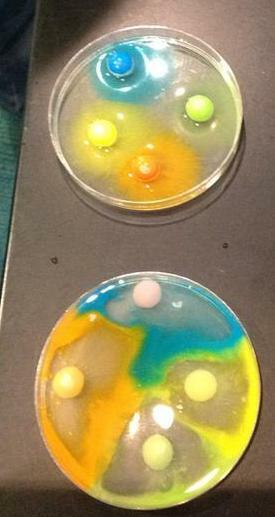 We did one more experiment using M&Ms. The colors separated much like the Skittles, but the candy coating didn’t dissolve during the time we had our program. The little rice paper Ms were left on, which was fun to see. What’s up in the STEM Room for the rest of the month? Lots of mad science: liquid nitrogen, dry ice, and more. We’re excited to work with the local high school science teachers. It’s such an amazing opportunity for our department and patrons! I love the shaving cream marbling. It softens the paper a little (like suede), and it smells so good! 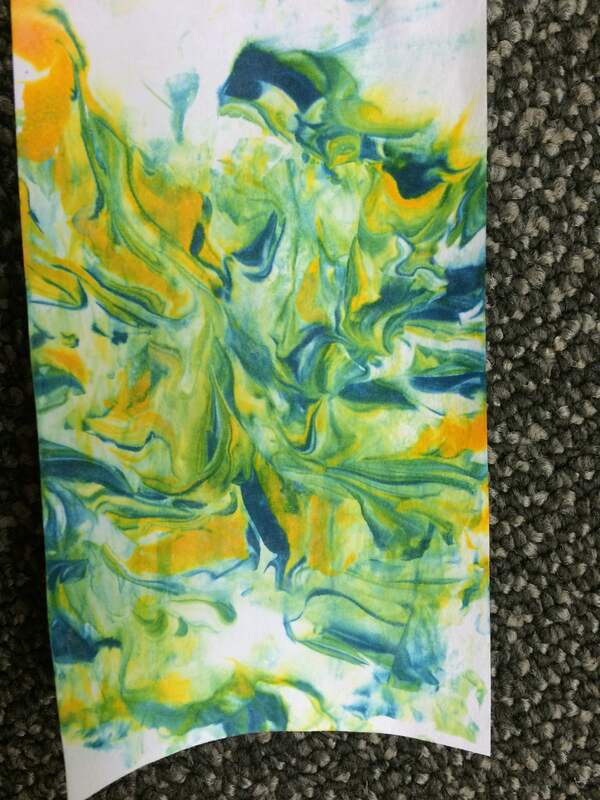 Once you have marbled your paper, you can cut it for crafting something else.